General Statistics: The Department of Piura has a population of approximately 500,000 and is located in the north of Peru. The department capital is San Miguel de Piura, but most people refer to it as Piura. The climate in general is warm and dry , although it tends to rain heavily in the highlands, such as Huancabamba and Ayabaca. For heat, check out Sullana. Getting there: Piura is easy to get to by land, sea or air. The drive is a smooth 15 hours from Lima along the recently repaired Pan American Highway. There is no shortage of tourist agencies in Lima or Piura, so travelers can take their pick. 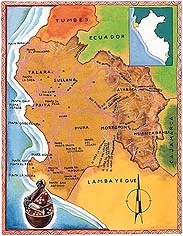 Several airlines fly the Lima-Piura-Lima route daily. The flight takes about an hour and a half. Where to stay: The city of Piura has approximately a dozen hostels, as well as several hotels, the best being the Esmeralda, Angolo and Tangarara. The department also has some pleasant beachfront hotels, such as Las Pocitas or Los Cangrejos in Mancora. Gustatory delights: Plenty of restaurants serve international, Piuran or criollo (typical Peruvian) food, including well known favorites featuring baby goat and rice, seco de chevalo (pork, rice and plantains), yucca and out-of-this-world beans, green tamales and delicious fresh fish or shellfish ceviche. There are also Chinese restaurants, pizzerias, peñas (clubs with traditional Peruvian singing and dancing) and discotheques.